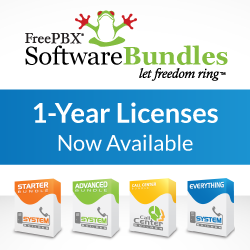 One of the most common issues that people come up against is that they’ve rolled out one FreePBX machine, and now they want another, somewhere else. And to make it just that little bit harder, they want to link them together. At first, this can be a bit daunting, but it’s not – when you know how. VSP That lets me send my own CallerID? Why does this seem to be so hard? And, more to the point, why are VSPs (VoIP Service Providers) so unhelpful these days? I realise that this isn’t really FreePBX related, but hopefully by putting this here I may find someone who can help. I should point out, this is only relevant for an Australian VSP – I know pretty much all of the major US VSP’s let you do this. It’s only the Australian ones who don’t seem to be interested in helping out. A couple of my clients are set up so that they receive calls via ISDN (BRI or PRI), and make calls via VoIP. This is a reasonably standard thing to do, offers the best redundancy and means that even if your internet connection is down you can still make and receive phone calls. OK, so it’ll cost them a bit more while it’s down, but it’ll still be working. Pretty much what a business wants. Strange Calls from John Doe <4000>? You may have seen/received calls on your SIP device over the last couple of days (this isn’t limited to Trixbox, FreePBX, or A@H, by the way – this is anything that speaks SIP) with a caller ID of ‘John Doe <4000>’. This does seem to be a world first – It’s someone, or something, actively scanning the entire internet for misconfigured SIP devices. There’ve been a lot of reports of this, as well as a lot of discussion on IRC. The most important thing is that most people don’t have anything significant to worry about. The second thing is that it’s going to happen again and again, as more people come up with this idea. Well, that was a bit of a surprise. I was just pointed at this. It’s an interview with Chris Lyman, who’s the CEO of Fonality, announcing that they’ve aquired trixbox. It seems, at first glance, pretty cool all round. But read on for my take on this.